Well, I didn’t know what a bap was when I first heard the word, though it really hearkened back to a very awesomely bad movie, B.A.P.S (p.s. my illustration is off — for some reason, I thought there were 3 main characters, not 2 — that’s what I get for drawing before IMDb-ing). Turns out that a bap is essentially a bun, and the term burger in a bap is quite common, as well as other baptastic foods, like sausage in a bap, which we saw at breakfast. But would “Think outside the bap” work as well for Taco Bell as “Think outside the bun”? It just doesn’t quite have the same ring to it. ‘Baptastic’ – we’re liking that one. 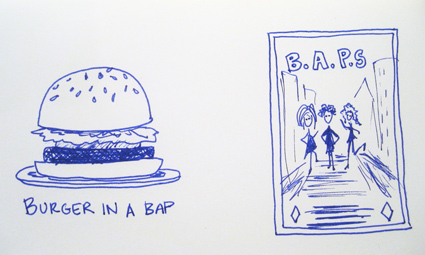 ‘Bap’ really doesn’t throw out any immediate, relevant associations, does it? Silly Brits (sez n. the American half).